Our Editor-on-the-Lam — a Bolivia-based psychotherapist and author — on the ethics of writing, and cherishing the tools of the trade: pens, pencils, typewriters and books. RIO CHICO, BOLIVIA — I have two pieces of art in my hands. One is a postcard of a painting by Bolivian artist Ricardo Pérez Alcalá. It shows a human skull morphed into a 1900s Remington typewriter — keys as teeth; paper-turning roll, ears; inner mechanics, jaw bone. Surrounding this ominous cranium lies a scatter of papers boasting the flourishes of 19th-century penned script and a couple of snails rifling through the debris. My immediate reaction is startle. Goodness! Here lies one potent commentary on the passing of typewritten words into post/postmodern cyber texting, I think. Yet, too, remains the possibility that the artist is remembering the transition from hand-written script to the typewriter – therefore proposing that human invention marches on through the ages. Whatever one´s interpretation, the image irradiates a feeling of desolation. The other item in my hands is Henry Miller´s 1951 The Books in My Life, a paperback I picked up on the English-language shelf of a bookstore in Cochabamba. Things are a little hit-and-miss here in the English-language department – tourists´ airport fare is most common – so when I saw it, a book by Henry Miller, I snatched it up. The cover offers a scrawled list of authors: Rimbaud, Powys, Lao-Tse, Emerson; a pencil and ink-dip pen, paper clips, and the tricolors of Miller´s favored landscapes, France and the U.S.
His bond with people of the earth. His relationship with his cobbler father who encouraged his flowering . . . The volume is a trot through the author´s history of reading and most especially a celebration of books. It includes a letter, written from Big Sur in 1950, to book reviewer Pierre Lesdain. In it he reveals his “larval” thoughts on such topics as Dostoievsky´s spirituality vs. that of Whitman and regales the reader with the details of a typical writing day. The appendix boasts a list of Miller´s 100 most beloved tomes. My favorite chapter explores the French “peasant-anarchist” Jean Giono. While Giono was extraordinarily prolific, perhaps his best known works are two: The Song of the World and The Man Who Planted Trees. His sensual reflection of color, taste, smell, and feel. His bond with people of the earth. His relationship with his cobbler father who encouraged his flowering. His gentle revelation of the truly important issues of life. Ah, ha! Herein lies Miller's essential point. Another Miller. Love and a shared passion for books and thought. “Each day,” he quotes Miguel de Unamuno, “I believe less and less in the social question, and in the political question, and in the moral question, and in all the other questions that people have invented in order that they shall not have to face resolutely the only real question that exists — the human question. “ The task of the writer, then, is not to proselytize or thrust opinion, but to illuminate the experience of existence. Call me a dinosaur! I live in silence and spaciousness. Needless to say, silence and spaciousness are required to contemplate such songs – and these are qualities difficult to come upon while immersed in satellite-linked, electromagnetic-agitating, post/postmodern virtual realism. Call me a dinosaur! I live in silence and spaciousness a few kilometers up the road from one of Bolivia´s most popular tourist spots: Sucre´s dinosaur-footprint Parque Cretácico. And let us not forget that said animal-kingdom antiquity remains the most favored in the intuitive world of children. It is true: I have long since eschewed the conception that the technological expansion known as “progress” and the society it proffers stand taller than those seen in the rear view mirror. Along with the insistence that they do comes the proposition that to look upon previous eras with admiration springs from idiotic qualities such as “naiveté” or “nostalgia.” Far be it from me to reiterate such out-of-favor insights as that for some two million years humans evolved, and find our greatest fulfillment, as reflections of the natural world; that the two, and now three, major “advances” fueled by technological invention – the agricultural, industrial, and computer “revolutions” — are products of the technological fix whose incentive is not the glory of “human invention,” but a seat-of-the-pants sprint to solve problems caused by the previous technological fix; that the global society that is the consequence of this utopian grab has caused unfathomable suffering and now, for its denouement, is murdering the planet. 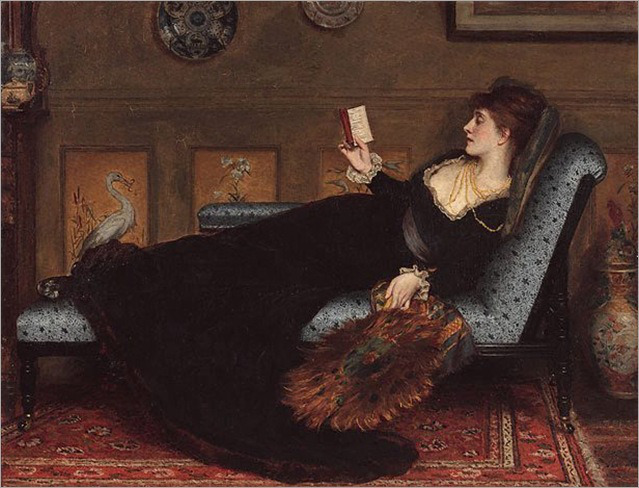 Robert James Gordon, 'The Reader', 1877. Yes, far be it from me for — with the longish memory of one born in 1947 — I can revisit the eras of my lifetime and report that, while the ravages of techno-imperialism were in full operation, the 1950s and ´60s, even ´70s and ´80s, at least offered an existence slower, more rooted, and more allied with community, both natural and human, than what all these new-fangled devices are spawning. Too, I have found that contentment and creativity become available only when I am not chasing the imposed velocity of cyber-reality but am, as in a Zen meditation, fully present in body and moment. And when there are books, time to hold them in my hand — and to relish them. Here in Bolivia books are still crafted as artifacts of beauty and newspapers still hawked on street corners — yet computerization´s ambush is astir like a rocket launch from Hal to the iPad in one fell swoop. I have taken some comfort from a curious source: a cadre of young Chuquisaceño poets who have decided that their writing would benefit from the use of quill pens. The steward of a hundred-year old Royal, I have been scouring the antique stores for such an implement as well. How did Shakespeare, or Charlotte Bronte, do it? we might ask. Or, skipping to the other end of the stick: in what form will we remember, study, and pursue the questions of existence when Peak Oil, widespread electrical failure, and/or economic collapse kick in? I say: let us tend to the works of art that remind us of how humans may live in synch with who humans are — and, along the way, cherish our pens, pencils, typewriters, and books. John L. Wellington (1878-1965). 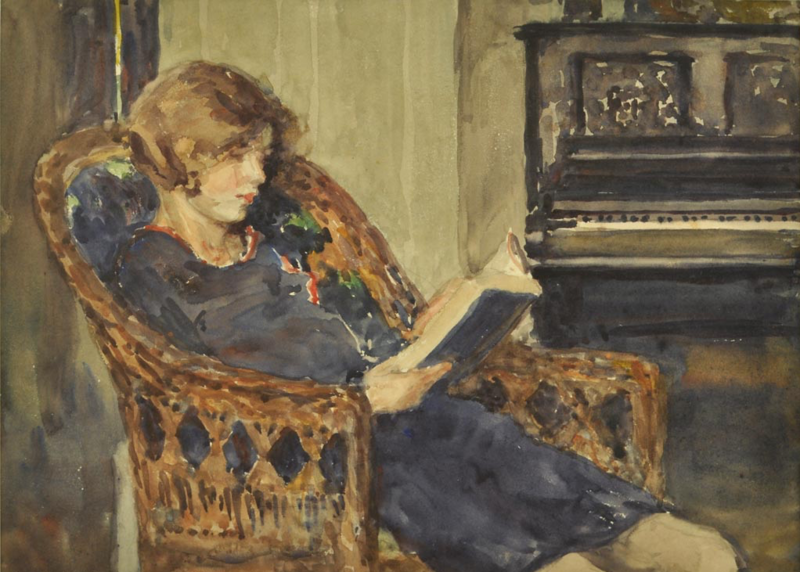 'Woman Reading a Book' (date unknown). The article was first published in The Journal of Wild Culture, July 6, 2015. CHELLIS GLENDINNING is a psychotherapist and the author of six books, including Off the Map: An Expedition Deep into Empire and the Global Economy, which won the National Federation of Press Women book award for nonfiction. She lives in Bolivia where she writes for Los Tiempos. Bookshelf image credit: Amelia Schmidt. A reminder of a writer's tools. I too love using pen and ink, picking up both new and old books, breathing in the musty or the new smells. I agree that it is vital to be in the body, to come out of the head and settle into a Zen place, only then can creativity be freed. I also love the idea of the poets wanting to use quill pens. 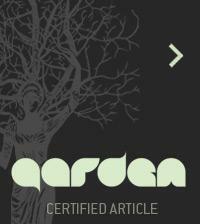 An enjoyable piece, thank you.